A week in Wales with old friends from the Husband’s Cambridge days. Four adults, five children under six and Bridie, the Irish terrier, in one house. Staying nearby, another household of four adults and four small children. It could have been a disaster; in fact, we had one of our best holidays ever. And much of it to do with food. Holidays used to be just about going away together, having some time out in a different place. Now, with two small girls, things are different. We have learned through experience there’s a certain amount of active planning involved so, freshly released from everyday routine, we all enjoy ourselves rather than – as has happened in the past – all get ratty with each other! Here’s my list/reminder for myself of the best things to do in Wales – or anywhere on holiday – with the girls. 1. stay with other kids. We shared a house with the English Engineers and their three children. Despite the fact that the last time the eldest two met they were only a few months old, their younger siblings not even gleams in their parents’ eyes, their six-year-old boy and two-year-old girl kept our two (now five and two) entertained and occupied while we were at home. The small baby, at just four months, was happy to observe and/or be cuddled by his elders. By the end of the week, the pair of terrible two-year-olds were inseparable, even at mealtimes when they insisted “you sit next to me” so they could continue their fun. 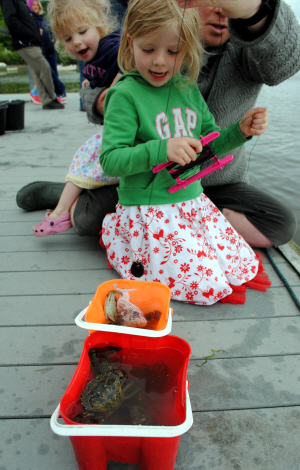 2. go crabbing. 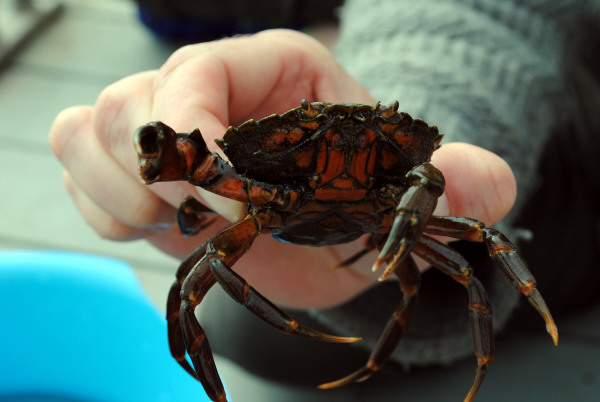 I had never fished for crabs but the Husband spotted crabbing lines at the RNLI shop on Poppit Sands for the princely sum of £1. We got four, along with advice on location (the pontoon right at the bottom of our hill), bait (bacon rind) and edibility (not great). Several satisfying mornings were spent crabbing, unwinding a long cord from the handle to leave the net bag of bait and stones drift on the bottom of the estuary, pulling it up a few minutes later and plopping the attached crab(s) into an increasingly crowded bucket. Amazingly enough, despite all the excitement, no one managed to fall in or pinched by irate crustaceans and we had a weather-proof way of entertaining all nine children in our large group. 3. entertain everyone with a decent mid-week market. Our base was the pretty town of St Dogmaels, on the outskirts of Cardigan, and it boasts a small but very useful market on Tuesday mornings. We came, we saw and we shopped: Harmony Herd sausages, Carn Edward Longhorn beef, Toleja Orchards supplied cider, lunchtime cheese came from Cothi Valley, along with the best pain au chocolate I have ever tasted. There was bread from Y Felin mill across the way and – happily for our pontoon-catchings – we also found a source of Cardigan Bay potted crab. 4. find one decent restaurant: with lots of small kids around, meals were either at each other’s holiday houses – Sunday lunch at ours was slow roast pork belly rubbed with pomegranate molasses/fennel seeds while the Teacher pulled off a pizza-making marathon when we called round to theirs on Wednesday – or picnic-style on the beach. But our household did manage one lunch out. Just down the road from us in Cardigan was a place called The 25 Mile. There’s a lot of sourcing-local ethos attached but the proof is very definitely in the eating and we all had a superb lunch, with the pick of a very good bunch being a spectacular salt beef sandwich with celeriac remoulade. We were happy with the price too: worked out at about £80 for eight, including sides, coffees and substantial brownies. 5. lots of good food, ready on time: with cold, wet kids coming in hungry from the beach, it was often a race against time to get supper on the table as fast as possible while they were bathed and pj-ed. A little advance planning and some great local ingredients made life easy: Harmony Herd sausages turned into a simple sausage and tomato stew; that Carn Edward Longhorn mince was turned into burgers one night, the remainder shaped into meatballs and served with pasta for last-night-dinner; there was egg-in-a-cup; and a clean-out-the-fridge supper. Nothing took long to get on the table and, most importantly, was wolfed down by starving children. The recipe for a good holiday? Share the work, feed the kids fast and make sure there are plenty of treats in the tins for all.